During my six month survival expedition in the wilderness I practised a reliable, and fast technique for starting a fire with a fresnel lens. This articles focuses on how to start a fire with a magnifying glass using only common, natural materials. 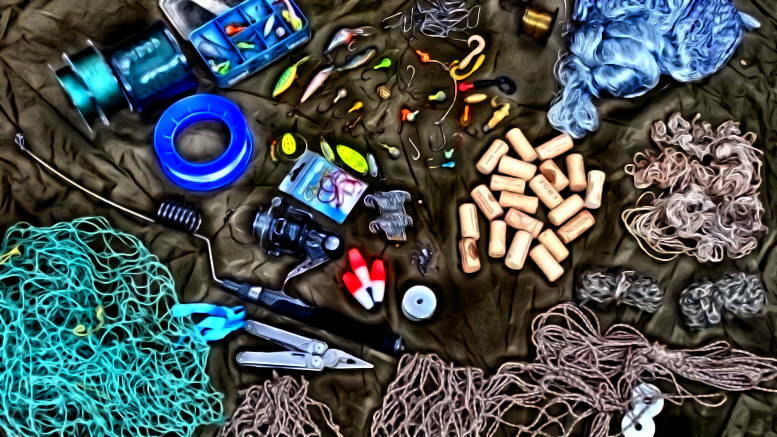 Making a tinder bundle for magnifying lens fires requires better materials than a tinder bundle for a friction fire. So starting fires with a magnifying glass is an excellent way of learning how to blow a small coal or ember to flame, be it to re-start a fire from remaining embers or to start a new one with a bow drill or hand drill. 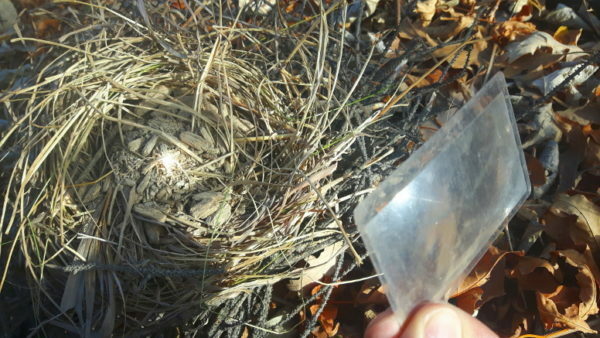 To start a fire with a magnifying glass using natural tinder I make a bird nest using two layers of tinder and one of fine kindling. When I can’t find the three different layers I build it using only two layers, but I don’t find it as reliable in difficult conditions. 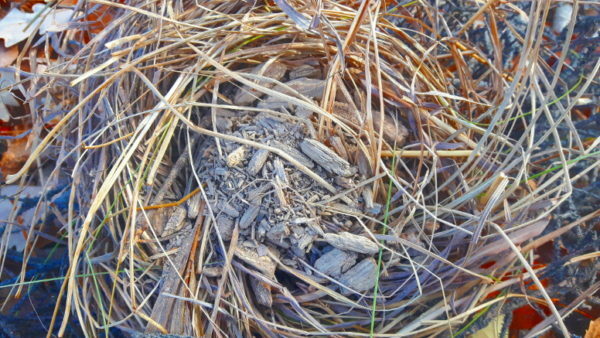 The outer part of the bird’s nest gives it its structure and cradles the other two layers. This layer of fine kindling ensures you can sustain and build a fire once your tinder bundle bursts in flames. Additionally it helps keep your tinder off the moisture from the ground or snow, and allows you to hold the bundle in your hands longer without burning them. 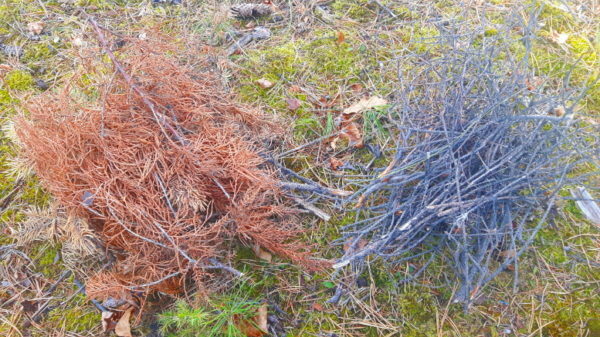 Red pine needles are what works best for me as the outer layer. But you can use strips of birch bark, inner bark, thin twigs etc. 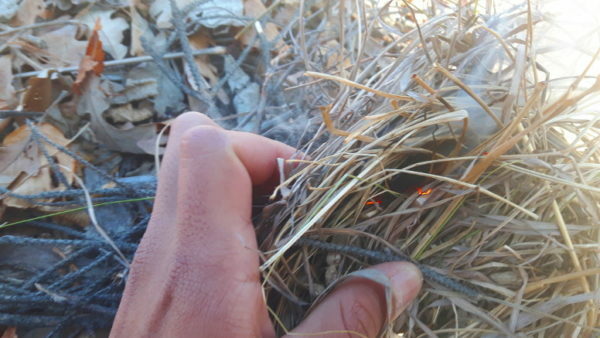 The point is to hold the bird’s nest with material that will light on fire easily with a flame, while taking a longer time to burn off. The middle layer should have finer tinder, that ignites easily, even if it lasts only a few seconds. Dry grass is one of the most abundant tinders in this category. 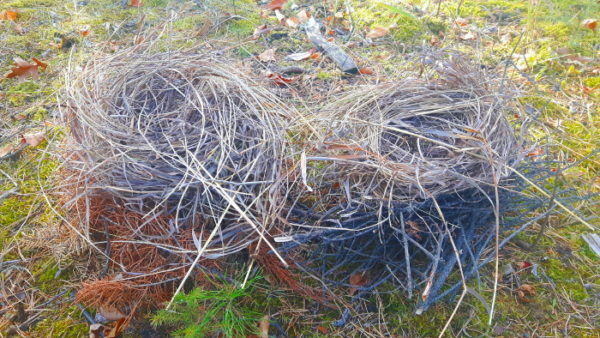 But you can also use inner shredded bark, cattail fluff, or an abandoned bird’s nest. The point of this layer is to catch on fire very easily with an ember or coal. A glowing ember doesn’t have a flame, so this layer of tinder must be fine and dry. This is the critical layer. 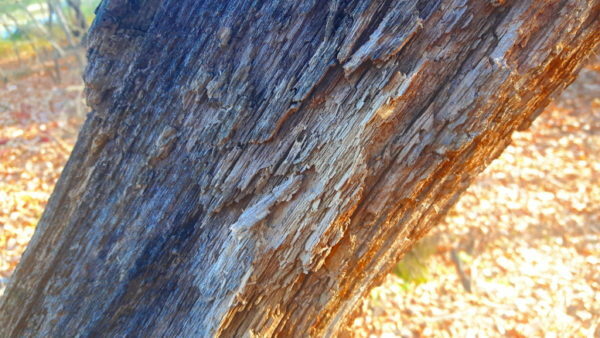 The most widespread natural material for this layer is punk wood. Like Chaga (tinder fungus found on dead birch trees), it can be used in the field without any preparation as long as it is dry. It snowed yesterday so the only dry punk wood I found was in the underside of a standing, dead tree. 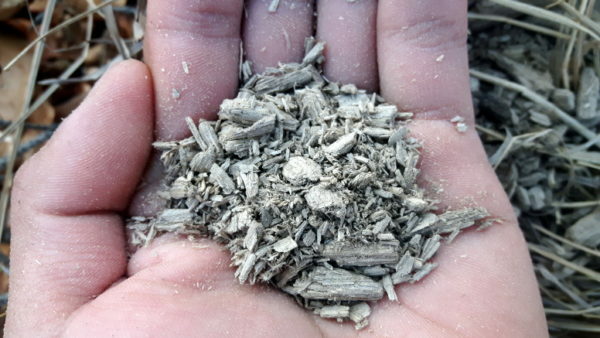 I like to find soft, dry punk wood and rub it in my hand to break it down into a fluffy powder. I compress the powder tightly and place it on the tinder bundle. Once the tinder bundle is complete, it takes seconds to minutes of focusing your fresnel lens unto the punk wood before it turns black and starts smouldering. 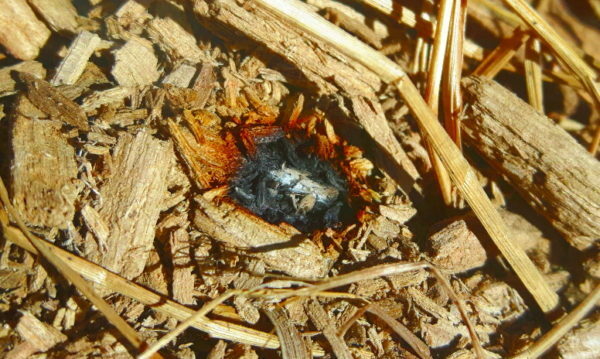 Then I focus the beam in the edge of the black spot to keep it smoking and make the burnt area bigger. Once the smouldering punk wood is bigger than a penny I remove the lens (it should remain smoking for a few minutes, otherwise the punk wood is not dry enough, or it needs more time under the magnifying glass). Careful not to disrupt the smouldering ember, I wrap the tinder bundle surrounding it completely. The next step I like to do is to swing the tinder bundle to provide a steady source of oxygen to the ember. Once my lungs are full, I began to blow steadily and constantly to grow the ember and light the middle layer. I swing the tinder bundle in the air while taking a breath to quicken the process. If the tinder bundle is dry and properly made, it should catch on fire as the smouldering tinder glows and grows in size. 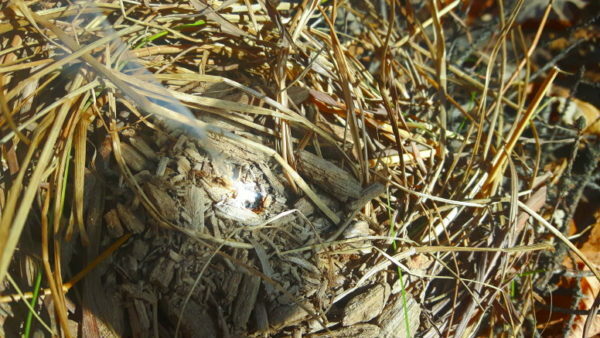 Once you see a flame, just place the tinder in the ground and begin to cover it with thin kindling first. Then progress to kindling of bigger diameter, and eventually firewood. As long as there is sunlight starting a fire anywhere with a fresnel lens is relatively easy. I always carry one in my wallet. 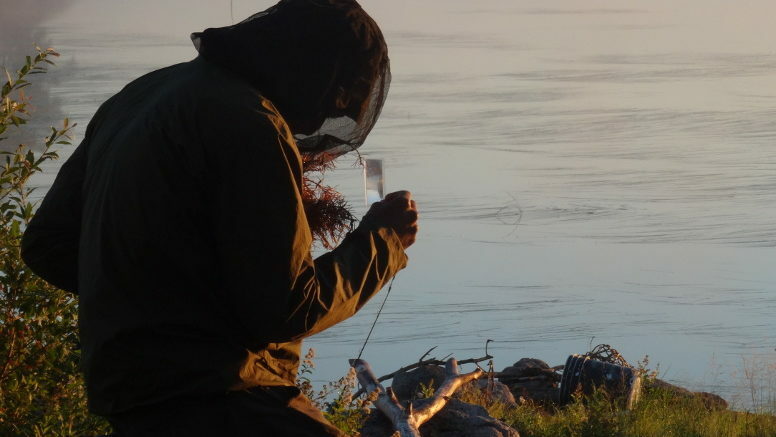 A great thing about this method of starting a fire is that you could light an unlimited amount of fires as long as you take care of your magnifying glass. 1 Comment on "Start a Fire With a Magnifying Glass Using Natural Tinder"
It’s not just for ants anymore.